Give those wings a rest, and throw together these little chicken burgers piled on a platter of salad. 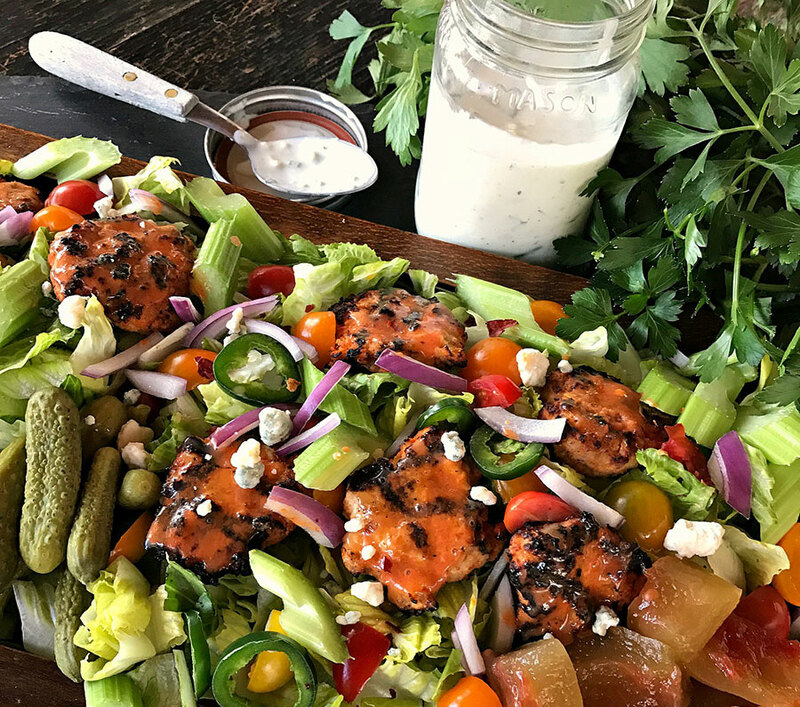 This salad is perfect for entertaining a bunch of folks without much fuss and can quickly and easily be doubled. (For the kiddos who don’t like the heat, make some without the hot sauce — really kid-friendly and a sneaky way to get a vegetable in them, too!). 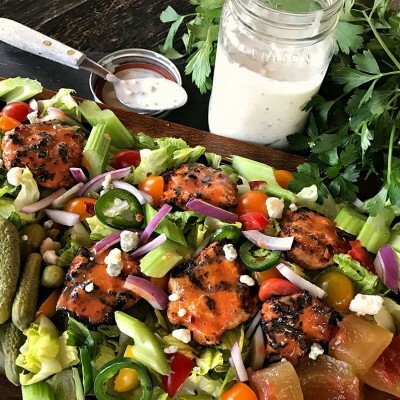 Finish it off with our companion dressing—Buttermilk Blue Ranch! Combine first list of ingredients and mix well. Refrigerate for at least one hour. Scoop golf ball size mounds onto tray. Cover with parchment paper and “smash” to flatten. Preheat grill to medium heat. Brush tops of burgers with basting sauce and place onto hot grill, brushed side down. Cover and cook 3–4 minutes. Baste tops sides and turn. Cook for another 3–5 minutes (until 165-degree internal temperature). On a serving platter, scatter lettuce then place prepared burgers on top. Scatter the celery, tomatoes, onion, jalapeno and cheese crumbles. Tuck mounds of pickles around the platter.